Several people have asked me about my laundry room and how I organize things to keep up with the amounts of laundry that we handle. I’ve talked a bit about this before, but haven’t showed the entire set-up. Our most recent modification has been to add long closet rods down both sides of the room. These rods function as clotheslines that work rain or shine. We most often use them to dry jeans, sheets, and quilts– the bulky stuff. The rounded bar lets clothing dry with less creasing, and the presence of the rods lets us use the dryer much less. It costs 50 cents an hour (or more) to run the dryer, and we do 3-4 loads of laundry a day, so I estimate that this simple modification saves us $1 a day, not to mention extending the life of our poor overworked dryer. In good weather we also use an outdoor clothesline, which cuts our electric bill even more. 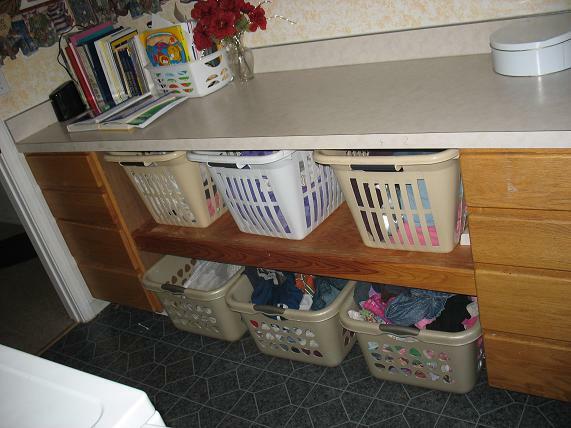 This has been a wonderful modification, and is one that almost any laundry room could fit. Even if your washer and dryer is in a closet in a hall, you could probably mount a rod above your washer/dryer. You can also use the rod to dry large quantities of shirts all at once, by simply putting the shirts on hangers to dry. My very favorite laundry room modification is the shelving my husband installed under a long counter opposite the washer and dryer. We have one basket per bedroom, and sort laundry straight from the dryer into each bedroom’s basket. Twice a week everyone folds and puts away their own laundry. In between times, kids can easily locate a favorite shirt or another pair of jeans. This system has worked really well for us. If my laundry room and my family were smaller, I would probably build deep shelves above the washer/dryer on which to store baskets. But since I’ve got a big laundry room, I use the above-washer space for bins of craft supplies. 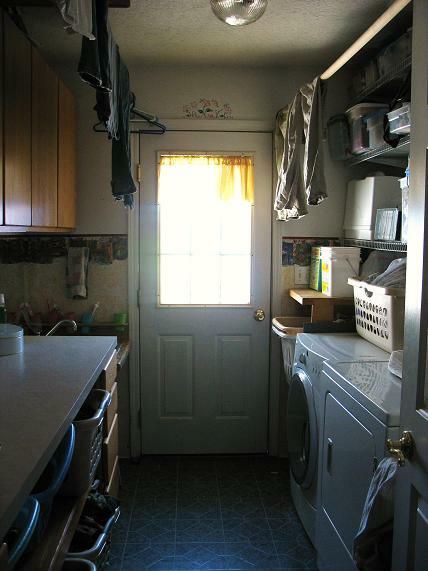 I’m blessed with a big laundry room, so I have some options that a lot of people don’t have. But even a sliver of space can be useful. This basket fits next to my dryer and is where we toss clean sheets and towels before we get around to folding them (twice a week, at the same time we fold clothes). This last picture shows the shelf John built to go next to my washing machine. It holds 2 big laundry baskets, and it is where we toss dirty laundry. When the baskets overflow onto the floor, I know we’re behind, and make sure to get an extra load done that day. Every now and then I dream of having two washing machines, but most of the time we keep up pretty well, and all in all, this laundry room is working extremely well for me. What works best about your current laundry room? Thanks so much, Mary, for this post. I’ve got so many ideas in my head now of what I want to do w/my laundry room. I have a list of questions I would like to ask you. Should I just ask you on the blog comments or have you set up an email for questions. I can’t tell you how much I’ve enjoyed reading your book. I’ve already started reading it again. It’s so hard to implement all these good ideas, when your so used to doing everything wrong, (that’s a strong word, but it’s true for me.) You have inspired me and given me the courage to ask my husband if we can adopt two instead of one, (we had come to an agreement shortly before I read your book to adopt one.) He said yes, and now we have accepted the referral of two little Ethiopian girls, ages 3 & 6. Also, regarding the laundry, do you just toss the clothes into their baskets? Or do you lay them neatly in there? I only ask because I hate wrinkled clothes. I don’t care about wrinkled sheets or towels, it’s just the clothes. I guess this is just something I need to get over. That is just awesome– congrats!!!!!!!! Yes, ask any questions on the blog– I’ll reply here, so others can read the answers. Yup, we just toss the clothes into the baskets, with the exception of dress pants, dresses and any shirts with buttons. Those we hang up on the rod for people to collect. 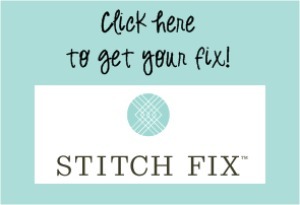 We tend towards easy care clothes and I am not too finicky about a wrinkle or two. Very nicely organized. I too have a bar over my washer and dryer. It is a very big help. My laundry room is not nearly as big as yours or as well organized. I keep 3 clean, dry towels by my dryer – a white one, a dark one, and a gray one. When I throw clothes in the dryer, I throw the correct color in with the wet clothes. The dry towel cuts the drying time in half. Impressive! 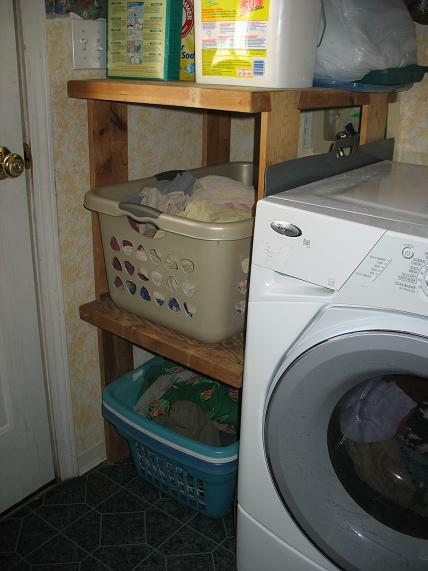 I would love more shelving, etc., in my laundry room but maybe the answer is just using what I’ve got better. I’ve wanted a bar/rack for years. Maybe this is my project for summer? Hmm. I have a new washing machine that spins at 1200 turns per second. It’s great! It’s in my kitchen. I have a drying rack that goes on the balcony, and two lines outside. I also do a lot of air-drying. For my family–I like to sort clothes–dark, whites, delicates/cold water. We have a small closet and instead of using the rod, my husband installed shelves that each old one laundry basket. We sort the dirty clothes right into the baskets and when a basket is full it goes right into the wash. I used to have a 3 section basket for sorting, but this works much better. I love all of your built-ins! This is one area in my house that could use a reorganization and I just never seem to have the time. My laundry room is sizeable, but serves multiple functions. Perhaps this post will be the inspiration I need to make the time to tackle this room. Or maybe not . . . but good for you!! I love the idea that you have going on of the shelves with laundry baskets. I may have to implement that one day. So fun to come over and see your laundry post. i just did mine on Sunday. I am a lucky mom of 14 kids. I always get asked the laundry questions. I’m going to snoop around for awhile… hope you don’t mind. Wow. Your room looks so neat. What a breath of fresh air … especially for someone with a large family. We have a family of five. My 19yos, 17yod and I (washing for my husband & myself) each have two days a week that are designated as “our” laundry days. My 9yod has one day (her clothes are smaller … take her fewer loads, thus less time to do her laundry). Our system has worked well – you handle your own clothes on your own day. The only problem we run into is when towels get behind. But, all in all, it works well for us. Thanks for sharing being so good about bringing us into your life. You bless many, Mary. I just finished my laundry room after our remodeling. I might take some pictures and post them as well. I took a lot of advice from people that commented on Pioneer Woman’s site when she was working on the mud room in the lodge. Your laundry room looks very practical (but I guess that’s what you need with such a big family, too). Instead of a curtain rod, I purchased a tension shower rod and it works great. My laundry room is only 6 feet wide, so it fits just right. I can’t hang really heavy stuff on it, but I’ve filled it with clothes on hangers and it has done fine. Another idea is to hang a second curtain rod down the middle of the ceiling over your bathtub (parallel to your real shower cutain rod). Then wet clothes can drip right into the tub! Thank you for sharing your laundry with us! I love seeing creative solutions to everyday problems. Wow, that’s a great system! Do you dry your clothes outside when the weather is good? I’m always curious about that as in my country we all have clotheslines (and it rains a fair bit here too) but in the States I haven’t noticed any in the areas I’ve been too. I always wondered how much it cost to run a dryer. Thanks! I needed a little inspiration. My laundry room is small but well organized and very doable for our “small” family of 6. But it is getting a bit messy. One thing I do (and recommend) is to hang as many of the kids clothes as possible. We have extra bars in their closets for such a reason. This way I put their clothes on hangers straight from the washing machine (on a poll like yours) and they dry and then are easy to put away. A good trick for wrinkles is to take your hanging or wrinkled items and toss them in the dryer with a wet towel for 5 minutes. They don’t shrink in that time and the wrinkles come out. I’m shopping for a new washer (dryer is fine). I see you have a front loader but not a matching dryer. 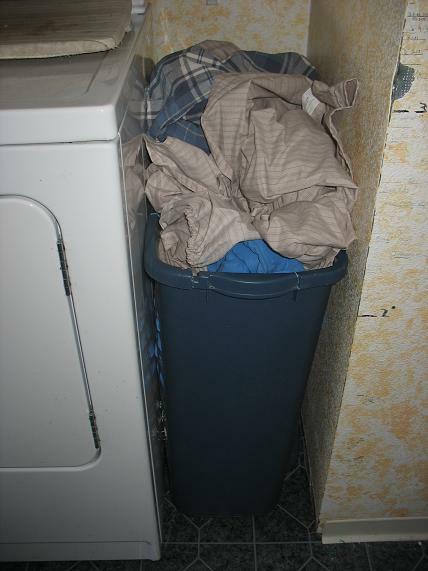 Does your existing dryer work well with the front loader? Do you have problems with too many wet clothes and not enough dryer space? I hang dry a lot of our clothes. Thanks for any input. Love your website!